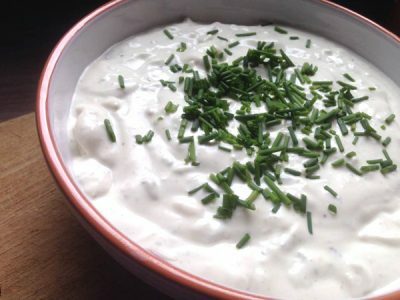 I love grilling and to keep my guests taste buds tingling whilst I grill, I usually make a few dips as starters and chunky gorgonzola dip has become a hit. Now I know so many people that buy ready made dips, nothing wrong with that and I must admit that in the UK there are some great dips and a great selection to be had. However, here in Germany they are a little behind on these things, but each year they do improve. Anyway, I am always looking for new dip ideas and this one foe a Chunky Gorgonzola Dip came from Ina Garten, the Barefoot Contessa on the Food Network and it is now tried, tested and tasted awesome! Therefore I just had to add chunky gorgonzola dip to the site as I’m sure a few of you out there will be trying this one! Easy to put together, chunky gorgonzola dip can be paired up with Grissini, tortilla chips, pita bread or even spread on a baguette, it doesn’t matter, what matters is the taste, and you can even spread it over a juicy steak as a sauce. You’ll love it and thanks Ina! Place the garlic, lemon juice, yogurt, mayonnaise, Gorgonzola, Tabasco, salt and pepper in the bowl of a food processor fitted with the steel blade and pulse the processor until the mixture is almost smooth but still a bit of chunk to it. Then add most of the chives and pulse a couple more times until combined nicely. Transfer to a nice serving bowl then cover with plastic wrap and chill for a couple of hours or so to allow the flavors to develop. Sprinkle the remaining chives on top and serve with raw sliced veggies and/or whatever you like to dip with.